The best way to make your home secure is not to think like a homeowner but to think like a burglar. 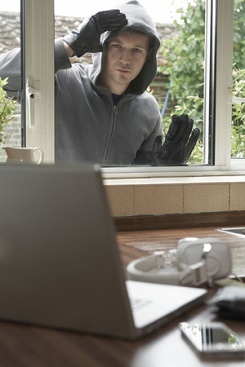 Take a good look around your house and your garden and assess it as a would-be burglar would assess it. By looking specifically for the things that a burglar would look for, you can take measures to make sure that their conclusion is ‘stay clear’ and not ‘worth a punt’. We suggest that you do this without necessarily preparing anything beforehand. What you want is a ‘snapshot’ of what your house looks like on a typical day. That way you can see it as an external observer would see it as well as observing how seriously other members of your household take security. Take a look at the doors to the property. Are they all closed? Pay particular attention to rear doors and patio/French doors. If any door is likely to be left open, it’s one at the back of the house – especially in summer when the weather is good. How easy would it be to slip through an open door? How far is the door from the street and are there any obstacles to negotiate to get there (such as a gate or walking past a window)? It only takes a few minutes to sneak in, grab some valuables and leave. Why not try a door to check whether it’s locked or not? It may seem like daring behaviour for a stranger to engage in but many will if it doesn’t look like there is anyone in the immediate area of the door. 30% of burglaries happen via unsecure doors and windows so this shows that burglars will risk it. Did you leave the door unlocked when you went out to conduct your little survey? You may be right there on your property but someone could easily slip through one door while you are looking at another part of the house. Lock up when you leave, no matter how short a period of time you intend to be out for or how close you are. Are any of your windows open? Do any of them look accessible from the ground floor? Could any of them be pried open any further? Are any windows single pane and therefore easy to smash? Sometimes houses have one or two odd windows that are not to the same standard as other ones in the home such as a downstairs toilet, a utility room or integrated garage. These windows could just as easily offer access to the house as any main window. Ensure that windows are kept shut unless someone is in the room and make sure that all windows in the house are double glazed and therefore not as easily broken. Can you see anything worth stealing through the windows? In particular, look for smaller items that can easily be carried away such as handbags/wallets, hand held gadgets/phones and jewellery. Most burglars will make an assessment based on how valuable a haul they’re likely to come away with. By leaving items on show they can see what they could get and exactly where it is. Hide these items from sight at all times. Many burglars don’t actually like to carry too much in terms of tools to break in for a couple of reasons: it’s incriminating if they are caught or if they leave them behind plus the less they have to carry, the more they can take from you. Therefore have a look around in the garden and around the vicinity of the property for items that they can use such as ladders, garden furniture, heavy tools or garden ornaments that could break a lock or window and trees plus hedges and other foliage that could be climbed on. Make sure that non-decorative items are locked away in a garage or shed and that items that live in the garden such as furniture and ornaments are placed well away from the house. Weight moveable items down if you can or secure them in position in some way. Also look for likely places someone could hide such as hedges or dark corners. Sometimes burglars will conceal themselves until the coast is clear such as watching for you going to bed. Make dark corner inaccessible by placing items in them and keep hedges trimmed back. Consider investing in some motion sensor security lighting or a dusk til dawn light to illuminate the area around your home. Can you see evidence of any security measures in place? An alarm bell box or CCTV cameras will show the burglar that you do have. Stickers and notices warning that these things are in place will also help. If you don’t have them it may be worth considering an alarm system at least as this is the biggest deterrent for a burglar. Look at the house objectively and see whether there are signs to indicate who might live there. Burglars have no compassion and will deliberately target a home where they think the occupant is vulnerable, such as an older person or someone who lives alone. They may also perceive a family home with teenagers as having potentially richer pickings in terms of gadgets and tech. Décor or even the kind of waste in the bin may give the game away so do what you can to throw them off the scent if this is the case (plain, neutral curtains at the windows and dispose of packaging of valuable items away from the house). You should also take a quick look around at your neighbours’ properties. A burglar will always take the easiest option and if there are houses with alarms and/or cameras that look secure they will always bypass these in favour or those who don’t – you definitely don’t want your house to look like the least secure one on the street! You’ve ‘cased your joint’, now what? Once you have gone through this exercise, it should highlight any weak areas in your security so now it’s time to resolve them. Some may a case of beefing up physical security measures, others may be more a case of changing behaviours or moving things around. Whatever they are, make sure you implement them fairly quickly. It would be pretty frustrating to be a victim of a burglary for a reason that you knew was an issue but didn’t do anything to tackle. Also make sure that everyone who lives in the house understands their own responsibilities for security and gets into good habits. It’s a good idea to keep doing these spot checks regularly as things can change and it’s easy to become complacent. Perhaps make a note to conduct a winter and a summer check. If you are wondering what other measures you could take to improve your home security then give us a call on 0345 833 5543 or call into our security shop in Wakefield.